Climate change has emerged lately as one of the main issues of concern, may be the most important, in economy and society. This was not so, even just a few years ago. Climate change used to be considered, even until quite recently, as something not much more than mere scientific hypothesis. But the situation has radically changed. The planet is now almost universally recognized as being in a state of emergency because of global warming and its impacts on the environment, economy and human societies. 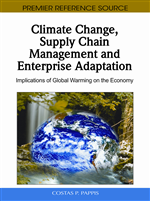 Enterprises are increasingly faced with the climate change challenge and with having to take measures to adapt. Countries and the whole international community are taking urgent measures to mitigate the causes of climate change and hopefully, in a rather distant future, reverse the catastrophic trend. Climate change is of anthropogenic origin. It is caused by global warming, which is in turn the result of particular human activities, namely, burning fossil fuels and change of land use, which followed the Industrial Revolution of the mid-18th century. These activities are producing excessive amounts of CO2 and other gases, the so-called greenhouse gases (GHGs), which absorb part of the thermal radiation emitted by the land and ocean and reradiate it back to Earth (the so-called Greenhouse Effect). The result is global warming which has tremendous impacts on Earth’s climate. While global warming basic facts will be summarized in the next chapter, a brief account of the current international situation regarding GHG emissions in different countries, particularly the most pollutant ones, may help put the discussion of this chapter into perspective. Emissions are produced in every inhabited part on Earth, but some countries, notably the industrialized ones as well some of the emerging economies, above all China, have a disproportionate share in the total production of GHGs. More specifically, the total and the per capita emissions of the top ten global CO2 emitters for the year 2006 appear in Figure 1 (EIA, 2008a). It can be seen that China and the U.S., with a yearly 6,018 and 5,903 million metric tons of CO2, respectively, are by far the main contributors of GHGs in terms of total emissions. China, with one-fifth of annual global CO2 emissions, has become the world’s leading source of GHGs, especially CO2, the primary heat-trapping gas, and its emissions are growing rapidly. However, in terms of per capita emissions, while Chinese citizens produce on average 4.6 metric tons of CO2 yearly, approximately equal with the world average, U.S. citizens contribute annually with an amount of 19.8 metric tons of CO2. In the case of China, its single largest source of GHG emissions is the burning of fossil fuels (coal, oil and natural gas) for electricity, heat and transport (EIA, 2008b). Coal is by far China’s most important fossil fuel, and some 80% of its total CO2 emissions from energy sources are related to the use of coal. The other major sources of China’s GHG emissions are agriculture (roughly 15%), industrial processes (9%), and waste (2%). An international comparison of GHG emissions by sector in 2005 appears in Figure 2 (Seligsohn et al., 2009a), where it is shown that nearly three quarters of China’s GHG emissions result from the combustion of fossil fuels for energy. Apparently, a different Chinese energy policy would have a profound impact on China’s contribution to global warming. China’s energy mix is unusually tilted toward industrial uses, and thus improvements in the industrial sector have large overall impacts (Seligsohn et al., 2009b). Figure 3, shows energy consumption by sector in 2007 in China, India, Japan, Russia, EU-27, and the United States.